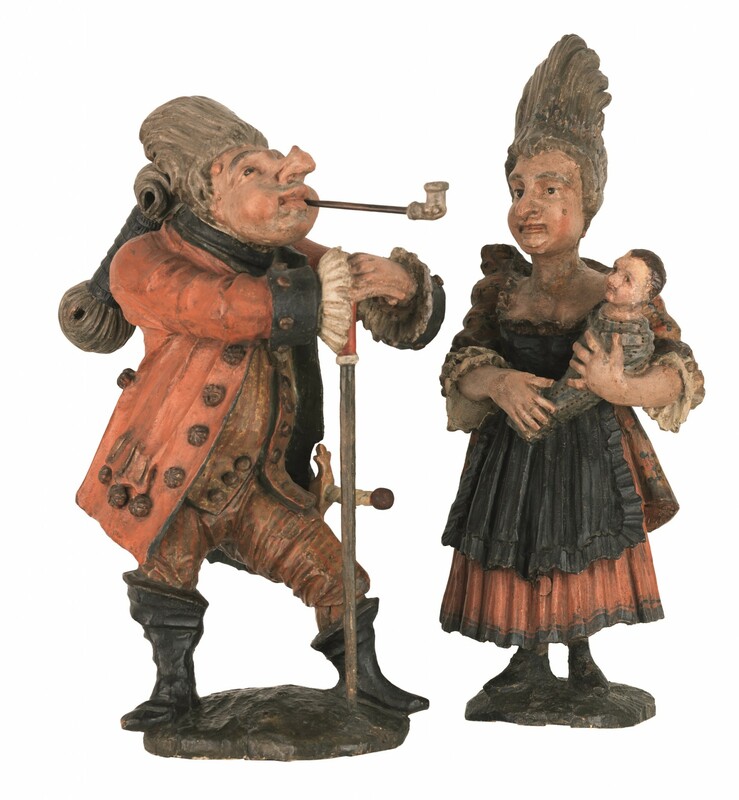 This humorous pair of figures is characterized by the masterful execution in the manner of Jaques Callot. The term “Callot figures” describes figures that, in addition to their realistic depiction, also show features of satire and grotesque exaggeration. The name itself refers directly to the famous draftsman and engraver Jaques Callot (1592/93 – Nancy – 1635) and his cycle “Varie figure gobbi” (Italian gobbo, “hunchback”) from 1616 which often served as a template or suggestion for dwarf figures. Another example of these types of figures was the „Il Callotto resuscitato oder neu eingerichtes Zwerchen Cabinet”, baroque engravings, called „Callotto” for short, anonymous and undated (probably Austrian, beginning of the 18th century) with 50 plates. As early as 1716/20, an extended edition with an extra 26 plates of the „Callotto” was published in Amsterdam. Grotesque figures, made in stone for gardens (e.g., Mirabell Palace in Salzburg), but also in paintings, sculptures or the arts and crafts enjoyed great popularity during the Baroque period. Lit. and pict. in: Helmut Nemec: Schätze der Volkskunst, Vienna 1976, p. 124–125. Plankengasse 5, 1010 Vienna, Austria · Monday to Friday 10 am to 6 pm, Saturday by appointment.